Snuck upstairs in an adjacent building for this view of the scene on the University of Washington campus in the pouring rain. Model T cars representing every state came to commemorate the original Alaska-Yukon-Pacific expo as they did in 1909. As I understand it the expo originated many still-extant campus buildings. 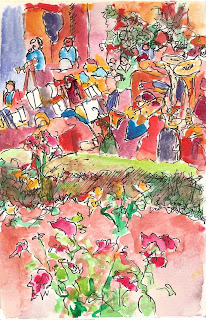 Here's a sketch of the brass band entertaining the crowd, from behind part of the garden. 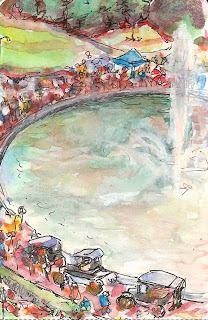 Thanks for the beautiful watercolor! I work with the City on the AYP centennial, and you're right that several AYP buildings still stand today: The Woman's Building (today Imogen Cunningham Hall), the Fine Arts Building (today the architecture building), plus the power plant and the Michigan Club Building (now the Physical Plant Office Building). Thanks, Chris! What little history I've picked up on the AYP is fascinating, and the local event was beautifully orchestrated. Kudos to all of you at the City! The rain was a bonus; Seattle's reputation regarding weather remains intact.